Another early start but I was all organised – today we were leaving Havana and making our way towards Trinidad in east of Havana. On the way we were going to be stopping at a spot for some swimming and onto the Bay of Pigs museum and Ceinfuego before ending up in Trinidad. I was a little nervous about the evening accommodation for the next three nights as we were all going to be in Casa Particulares (essentially B&Bs) and as I am booked on as a single traveller I didn’t know who I would be in the same place as. Give me something to worry about and I’m there!! I got to the bus early to ensure that I got a front seat (more of a view!) others were tending to nap on the bus and I was looking forward to having a fuller view of the road and country life as it whizzed past us on our journeys. There was also the chance that I might have been able to have read the subtitles on the documentaries that Marlon was showing on some of our trips. Some were readable further back but others definitely not. Our first stop was at Finca Fiesta Campesina where we made a facilities stop and had the opportunity to grab a coffee. It was so blooming hot the last thing that was on my mind was a coffee! We were told there was a mini zoo here as well so a few things to potentially look at. As we walked in we were invited to join in Guinea Pig roulette. Really? Not my thing at all and so quickly walked on past and further in to find the loo. I didn’t think I was going to enjoy seeing the animals here after that greeting! I wondered round and had a nose at the animals anyway – thankfully most of them were in the shade anyway so it was slightly cooler than in the blaring heat. I met a friendly iguana in a pen who almost seemed to smile for my photo. They really are the most prehistoric looking creatures it must be said. Quite evil looking as well. There were several pens with animals in: Guinea pigs, pigeons, chickens, a tree rat and more. There was also the opportunity to ride on a bull, rather a scrawny bull who was mainly skin and bones who, in the whole time we were there never seemed to move a millimetre from his spot. I found a beautiful little orchid garden and spent a little time in there taking some photos of the beautiful plants. It was also incredibly shaded and so nice and cool as well. There was not an over abundance of them in there but I’ve no idea what the best time of year is for growing orchids?! I stumbled across a pen with a crocodile in it that was there with its mouth wide open, I am sure I’ve read somewhere the reason for that, sleeping or trying to cool off or was it when angry? Next to the pen was a keeper with a snake around his neck and holding a baby crocodile. Not sure why or indeed how but I ended up with the snake around my neck and holding the baby croc. It moved on my hand and I squealed as it tried walking up my arm. The photo is quite amusing as I look quite calm, all things considered – but trust me I was bricking it inside! Having purchased the last of the chocolate ice cream cones I then made my way back to the coach for a a bit of a clean down with wet wipes and antibac!! On from here was our much anticipated swimming spot of Cueva de los Peces, also known as El Cenote. We had been hugging the coastland for about two or three kilometres before we stopped and so I had been getting snippets of the beautiful crystal clear Caribbean Sea. The El Cenote tho was an added treat, it was a flooded cave that was full of tropical fish down a small rocky path from the main road and although so close, very secluded and stunning. It was around 70 meters deep – not that I was going to be testing that out!! The changing rooms were small and there were all of us to change so I decided not to bother and to use the skill of changing underneath a towel without flashing, knew boarding school would come in handy at some point!! The steps to get in were very wide apart and so I kind of stood on the top one and belly flopped in, thankfully not managing to empty the entire pool. It was cool and refreshing and salt water which I had bet really expected! I didn’t spend long splashing around in here before I gathered up by bits, flung a sarong round and awkwardly, in wet flip flops, made my way out to the open to cross the main road before slipping into the sea. It was wonderful – this was the life!! Bobbing around in the Caribbean Sea. We all wished that we had longer to do so – but there’s always the trip to the island later in the week. As we bobbed around chatting we had tropical fish weaving inbetweeen us in twos and threes. Amazing! I tried using goggles from someone to have a peak at the world underneath us but wasn’t overly successful as they leaked and salt water went into my eye and I gave up. I lay in the sun taking over bag duty from someone to keep and eye on all of the bags and was almost dry by the time it came to change back into clothes for lunch and then the onward journey. You really can’t argue with that view now, can you?! From here we headed on round the Bay of Pigs to Museo Girón which was a two roomed museum that was dedicated to the time of the invasion and the invasion itself when Castro and his men over came the advancing American forces and captured 1180 prisoners who they, in time swapped for Baby Powder and medical provisions so desperately needed by the country at the time. There were some fascinating artifacts and military bits and pieces such as guns and ammunition from the time as well as tanks and other vehicles. Out the front of the museum there was one of the fighter planes that was used to attack the advancing Americans of the time. Once I had finished at the museum I nipped across the road to the shops in search of an ice cream. It was utterly roasting and I was literally dripping thanks to the humidity. There were two very small fans in the museum that were more swirling around the hot air than blowing out any cool air. I gave in and headed to the bus to try and cool down. It felt far far hotter than it had been in Havana but I am not sure if that was actually the case or not! The gap from the rip in my trousers was getting bigger, but this was actually turning out to be rather to my advantage even if there was skin exposure evident now! On from here we headed to Cienfuegos which was established in 1819, far more recently than most cities in Cuba and it was founded by French settlers – I’m not sure that I saw too much of their influence in the architecture however, but maybe we didn’t go through enough of the city to see. We stopped in Pargue Jose Martin to stretch our legs and get a drink if we wanted and to have a look at the buildings around the square. There certainly were some very fine ones including the school which has a sort of Greco-Roman facade that looked far too smart to house a school! There was the Catedral de la Purisima Concepción in the corner next to the school which I didn’t go in to as I couldn’t do everything which is still used by resident worshippers as well as tourists and has, according to the guide book, some rather splendid stained glass. The building that I chose to go inside and spend some time in was the theatre – Teatro Tomás Terry which has been in the northern side of the square since it was built in 1890 and musical and dance productions are still put on here, in fact there were some dance rehearsals going on whilst I sat in the auditorium taking the surroundings in. The entrance hall has a fresco on the ceiling and on some of the walls and there were the original decorative ticket booths from the 19th century still in the entrance hall too, there were also some beautiful ornate lamps as well. Moving on in to the auditorium the seats were all wooded and there were three tiers of balconies each with their same wooden chairs I imagined from when it was first built. There was a large Baroque- stayle fresco on the ceiling and the stage was framed in gold and sloped down towards the audience to help give them a better view. It was a wonderful find. Before heading on towards Trinidad we made a trip out around the small peninsula – spotting the seaside on our way and many of the expensive looking mansions along the way. Just before the end was the Palacio de Valle with, as described in the guide book, ‘mismatched twin turrets, chiselled arches and carved windows, it looks like a cross between a medieval fortress, an Indian temple and a Moorish palace.’ Originally built as a private home in the early twentieth century it is now nothing more than a restaurant and has a rooftop bar apparently giving the best views in Cienfuegos. Back up the promenade and out into the road to Trinidad. Along the road on our journey we saw farmers bagging up rice on the side of the road which looked rather strange. Marlon explained that they were drying the rice out using the warmth of the Tarmac to help speed up the process. It went on for a good few miles at one point and there were several of them bagging it up in areas. Drivers were not really bothering to avoid it on that side of the road (the left, as they drive on the right) and you often saw them driving over the drying rice – most certainly very organic! Trinidad sort of arrived upon us, we had started noticing the more built up are but hadn’t realised that this was actually down town Trinidad?! We passed through a main square with the green hotel that we would be meeting at later but first we needed to be ‘sorted out’ with our Casa Particulares. It was like waiting to be picked for a team at school! I was concerned as to where I’d be and who with, not that it really mattered as everyone in the group was lovely. I ended up with Nic and our Casa Particulares was apparently a 4 min walk front the HavanaTour office where we were being collected from. Well that’s what Nic had been told / understood anyway. It wasn’t that much longer but it certainly felt it as we dogged our cases over the cobbled streets!! Prob a 5 min walk from Parque Cespedes where the green hotel was that we were meeting in front of later. Casa Lydia was basic as expected and despite being welcomed and shown our room there was no other explanation, something that we could have done with if honest as we struggled every time in how to open the front door from the inside and outside and which key was for the front door and which for the room and why did I have an extra key on mine? What was that for?? We each had our own bathrooms and a shower but no holder on the wall to hold it as always! There were two ac units much to my relief and I even had a little patio area outside my door where I assumed we would be served breakfast in the morning. There was a fridge in the room as well full of cold drinks which you could take and pay for on departure. We were asked for our passports, as the lady didn’t speak any English or even enough to get by we had no idea when we would be seeing them again. I thought that they possibly needed to prove that they had tourists staying and so needed to note down the number and so on for authorities to check. We checked with the others all of who had the same thing and that they would be given them after breakfast the following morning. I felt a lot better having heard that! Our meal that evening as at a place called Vista Gourmet and was another paladar. Another buffet option, none of which really looked all that appetising and so I opted just to have the main course (and plenty of drinks!). It took what seemed like hours to get a drink despite ordering first out of the tables of ‘us’ we were getting more and more desperate as the entertainment that we were also going to have to endure during dinner became closer and closer and from the looks of things it was going to be excruciatingly embarrassing. Apparently my face literally said everything. Totally unimpressed. Some crappy dancers and then male dancers joining them, the compare singing possibly THE worst rendition of Ben E. King’s – Stand By Me that I have ever heard and the rather cool fire dancer. The highlight of our evening though had to be when a member of our group (Jo) got up and out of the blue started fire dancing – there is no way that she would have so easily been allowed to get up and do that in the UK – way too many health and safety restrictions!! It was a great evening full of giggles and hilarious stories all which I shan’t repeat as it was a case of you had to be there. 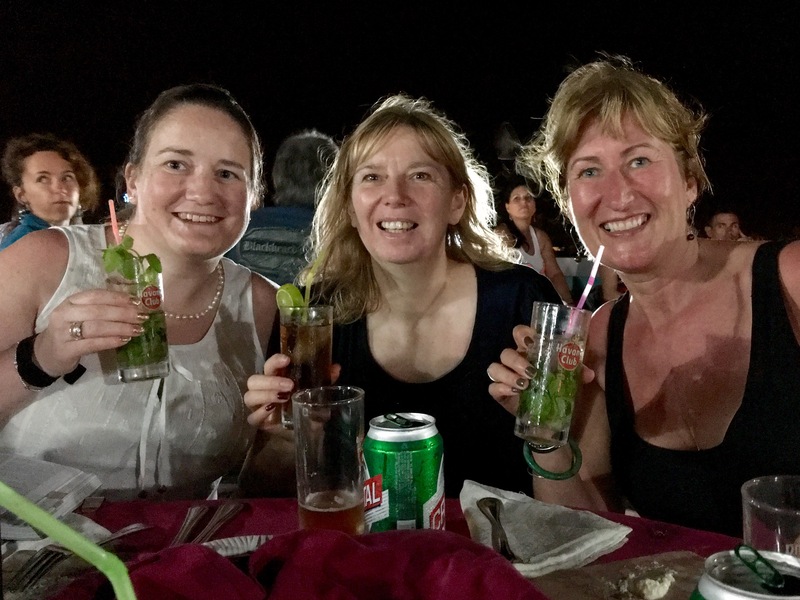 For my own sake and any reading that were there – Julia and the fire and lift (more Ivor’s fits of giggles) and the cerveza & mojitos from Kate. We headed to the steps (Casa de la Música) and had a further mojito whilst some went salsa dancing before heading back to the Casa to establish that we had no idea how to use the key to get in, only to have the door opened (we were possibly a little giggly) from the inside by an 8 year old girl! We did think at one point that we would have to sleep in the street as the door wouldn’t budge!! Posted on December 30, 2015, in Cuba, Uncategorized and tagged americans, bay of pigs, capital, Cuba, dance, farmers, fighting, open water, rice, swimming, theatre. Bookmark the permalink. Leave a comment.